A single entry blog about a trip my Dad and I took to Minnesota; where my Dad lived for a summer 40 years ago. I love my Dad. That shouldn�t be a big shocker, most kids love their parents. Sure, I gave my Dad heartburn like most teenage kids but as often as I got in trouble I knew that my Dad loved me and I loved him. Of course, I didn�t understand what he meant when I would get my tail chewed out and then he�d say, �I do this because I love you!� Because you love me? Sure. Now that I have my own kids though I know exactly what he meant. Dad was basically saying, �I could care less if your friends do stupid things and end up as losers, but there is no way that I�m letting you get away with certain behaviors without laying the law!� Now that the days of getting lectured are over, well mostly, I�m glad I learned those life-long lessons. Getting in trouble is hardly my only memory of my Dad growing up. We did a variety of things together. He helped me earn my eagle scout, would go outside and throw the baseball with me, made me scrub the whitewalls on the tires of his station wagon, and he always tried to make it to my basketball games. My Dad had one of the voices that travelled through the gymnasium like a freight train. Not only could I hear what he was saying all game, all my buddies could pick his voice up from the crowd as well. If you weren�t hustling enough, he�d let you know. If you just made a great pass, the entire gymnasium would know. And if you hit a big shot, his voice penetrated all the other commotion and his words would ring in your ear. Even to this day, my buddies love having my Dad in the crowd at city basketball games because he cheers us on loudly and with great support. So when my Dad�s 60th birthday came rolling around, it was time for me to throw some love and support his direction. 2008 was the year my Dad turned 60 years old while I turned 30. We�ve worked together at our family real estate company since 2000 and my wife would often observe that I spent more time with my Dad then I did with her; between golf and work, she was right. Working with my Dad has been a real treat and he has helped me develop professionally in a lot of different ways. For his birthday, I wanted to do something special and show him how much I�ve appreciated what he has done for me in every aspect of my life. I wanted to do something that he wouldn�t do for himself, but it couldn�t be something so ridiculous that he couldn�t enjoy it because it was too irrational. Therefore, dropping $500 to play Pebble Beach wasn�t an option since my Dad isn�t as diehard about golf as I am. But he enjoys golf quite a bit and it is something we can do together so I knew I would be incorporating it into the mix somehow. 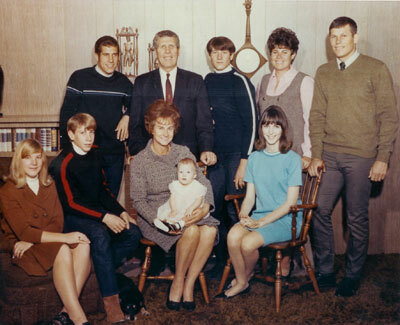 During the summer of 1967, my Dad lived in Minneapolis while his Dad served as the LDS Mission President for the Northern States Mission. My Dad was getting ready to leave on his mission to Southern California/Arizona but wouldn�t be leaving until he turned 19 in August. So he spent the summer cutting trees and battling the oversized mosquitoes that Minnesota is famous for. I had never been to Minnesota and my Dad had never been back since that summer over 30 years ago. As I started researching golf courses I realized it would be the perfect fit. 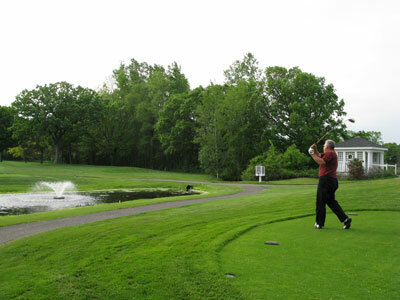 We could go back and enjoy the old, classic courses that my Dad loves while going back to a place he likely wouldn�t vacation to with my Mom on their own. So I let my Dad know that for his 60th birthday I would be taking him to Minnesota where we would enjoy some of the sights and play some of the country�s finest courses. I think it was the perfect combination. It wasn�t SO ridiculous of an idea that he couldn�t enjoy himself yet was definitely something he had never considered doing. You see, it is tough figuring out what to do for my Dad for his birthday or for Christmas. He�s at a stage in life where he pretty much has the things in life that he wants and so us kids are left with seeing how creative we can be in what we do for him. Waxing, cleaning, and vacuuming his car ALWAYS goes over well. Taking him and my Mom out to eat is a safe bet as well. But taking him on vacation was unchartered territory and we were both excited about it. Originally I had less golf and more sight-seeing planned, but I have an uncontrollable habit of trying to get in as many great golf courses as possible when I visit a new area. It doesn�t matter whether I have time for three rounds or 15, it seems like I always have to leave courses off the list that I wish we could have picked up. In the end, I narrowed it down to eight courses over the course of five days. That is a mild pace by my standard but my Dad had to really gear himself, and his back, up for such a strenuous pace. I booked the flights, choked over the extra baggage fee that the airline recently implemented, and we were ready to go. 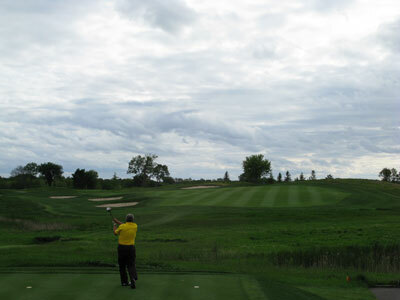 When we landed in the Twin Cities it was business as usual for a golf trip as we grabbed our rental car and headed straight to the first golf course. We found ourselves at North Oaks which is an early 50s Stanley Thompson layout that Tom Lehman did a renovation to in 2007. The majority of Thompson�s courses are found in Canada, his native country, so it was quite a treat for me to step foot onto North Oaks. The course was really great and featured several elevation changes and mature trees. I particularly enjoyed the par four 7th hole which is one of Thompson�s gems. This slight dogleg right plays uphill to a green that is encircled by a berm but features an opening in the center so that you have a partial view of the green. Two bunkers appear to be fronting the green when in actuality they rest about 20 yards shy of the putting surface. It is a unique hole that you won�t soon forget after playing it. That evening we worked our way over to Edina to stay the night in the condo we rented for the duration of our stay. It was located in a nice neighborhood that was convenient to many of the courses we had lined up for the trip. It was particularly close to the course we had scheduled for the next morning; the perennial top 100 ranked Interlachen Country Club. Willie Watson designed the original nine hole course that opened in 1911, but less than ten years later Donald Ross was employed to redesign the course and make it a full 18 holes. In fact, Minnesota has a nice little pocket of Donald Ross tracks with Interlachen being the gem that attracts the most accolades. We had the opportunity to play the course three weeks before Interlachen hosted the Women�s United States Open, Annika Sorenstam�s last. Interlachen is most famous for hosting the 1930 U.S. Open that Bobby Jones won (on his way to the Grand Slam) while scoring a birdie after skipping his approach off a lily pad on the 18th hole (9th hole for member play). 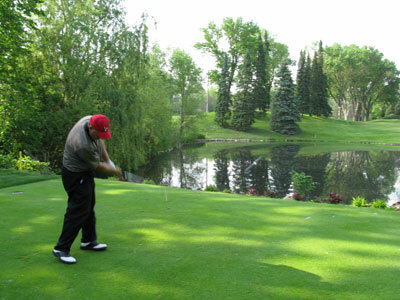 The course is a classic with rolling terrain and mature trees abounding. Water comes into play on six of the holes with one hazard showing a reflection of the towering Swiss inspired clubhouse. History and tradition oozes at Interlachen and the course is a real treat, until you find your ball deep in the U.S. Open rough! That afternoon the gloomy cloud cover burned off and we were presented with glorious conditions to play another Donald Ross classic; Minneapolis Golf Club. Willie Park did the original work in 1916 before Donald Ross was hired four years later to design the course you see today. The timeless course features plenty of character with the kind of layout you could play day after day. Like many of the older golf clubs in Minnesota, the course is heavily treed with gentle terrain contours throughout the layout. The signature hole is the lengthy par three 10th hole that plays over a pond and a series of flowers that are patterned to form the club�s logo. Being from Idaho, I live quite a distance away from the nearest Donald Ross course. So to be able to play two courses in the same day designed by the legendary architect was quite a treat. Thursday has us slated for an A.W. Tillinghast design that doesn�t receive near the attention and accolades that other Tillinghast courses manage to; Golden Valley Golf and Country Club. Located just seven miles northwest of downtown Minneapolis, Golden Valley is a well established club with an older membership base. 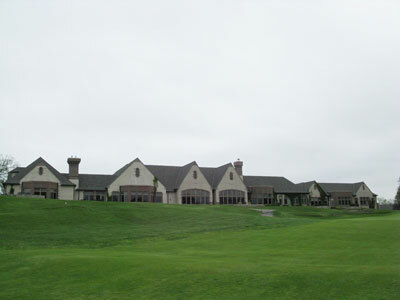 The first thing we noticed when we pulled up to the course was the massive clubhouse; over 60,000 square feet! The backside of the clubhouse is completely covered in windows and represents one of the most impressive structures I�ve ever seen on a golf course. The course itself features rolling terrain and masterfully designed green sites that are challenging and subtle. The hole that I�ll always remember is the par five 2nd hole. The green site sits well above the fairway and features a massive false front. I watched my Dad hit two approach shots that creped onto the putting surface, and then zipped back down the fairway 50 yards from the pin. Being the brilliant man that I am, I promptly clubbed up two additional clubs and figured getting down in two from a 50 putt was a better proposition than trying to wedge it close to the front right pin placement that begged to claim numerous victims throughout the day. All in all, Golden Valley is a really good golf course. For me, other Tillinghast courses like Bethpage and San Francisco GC are quite a bit better than Golden Valley, but Minnesota has itself a nice little hidden gem. That afternoon we were slated to play in Wayzata at the Woodhill Country Club. Woodhill is yet another Donald Ross design that I had heard some fantastic things about and was the type of course I knew my Dad would love. On our way to the course it begins to rain . . . hard! 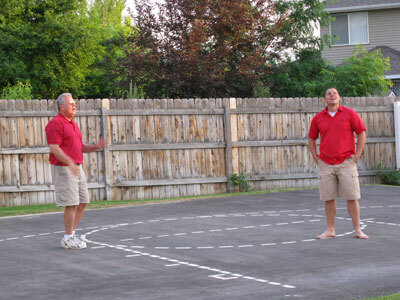 We pull into the parking lot and my Dad tells me there is virtually no way we are playing this afternoon. I told him we had enough daylight to wait it out for a while. There has been more than once that I�ve been at a course and a storm blows over and leaves perfectly calm conditions to golf in. We went into the pro shop and hung out with Phil Reith, Woodhill�s head professional for the past 40 years. He told us stories about Wayzata native, Tim Herron who is affectionately known as �Lumpy� due to his relaxed physique. We hung out for nearly an hour waiting for the rain to pass with no luck. Then, there was a short silence. I was super excited and walked outside and was nearly hit by a large ball of hail; and then it started hammering down! 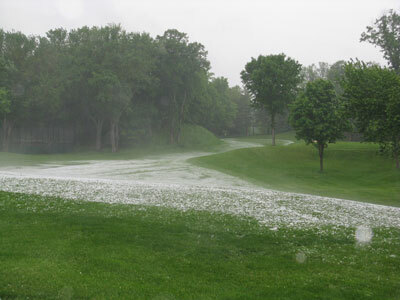 The humble pro shop sounded like it might cave in due to the size and speed of the hail balls bolting out of the sky. It backed off enough that we sprinted out to our car knowing that there was no chance of us playing today. As we drove off we took a picture of one of the fairways, covered in hail. Finding white stuff all over the fairways was a problem I thought Minnesota only suffered from in the winter, not in June; but I was wrong. More bad weather ensued the next day and we found ourselves hanging out in the condo. My Dad�s mother passed away while we were in Minnesota so it gave him some time to make some calls to family members and to work through the funeral arrangements. Fortunately, we were able to get those items taken care of and the funeral scheduled for when we got home. It rained all morning and the wind was really howling. We ended up pushing our only round of the day back to 3:00 in hopes that it would be enough time for us to wait out the bad weather. 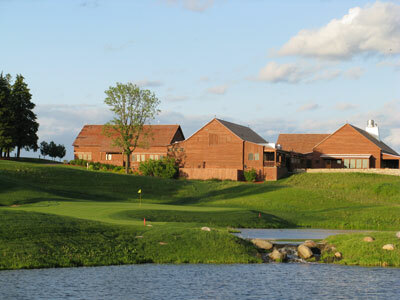 We eventually loaded into the car and drove west 25 minutes to Independence where Windsong Farm Golf Club is located. Windsong Farm opened in 2004 and is a John Fought design. John Fought has a special place in my Dad�s heart as well as mine since he is former BYU golfer (where my Dad went to school) so we were excited about the opportunity to play one of his courses so far from home. We arrived at Windsong Farm and instantly noticed the country-farm theme due to the large barn-looking clubhouse and several other buildings on site that looked like it was straight out of the opening scenes of Wizard of Oz. Due to the heavy rain, we weren�t allowed to take a cart but were given a push cart to haul our clubs around with. Generally that isn�t a problem, but with the winds blowing at a steady 30 mph with gusts over 40, that can be quite the trek to take on. Undeterred, we load up and head out on to the course. With the surrounding conditions being so crazy, we thought it would be less discouraging if we just played a 2-man scramble and take on the course together. The course was immaculately maintained and the hole designs were fantastic. The signature hole is the drivable par four 3rd hole that features a forced carry over water and then water up the entire left side. The putting surface is further guarded with a pair of bunkers on each side and has you puckering if you pull out the driver. A few holes into the back nine the wind backed off and by the final four holes it was dead calm. It was a neat moment being out on a great golf course, alone with your Dad, with perfect conditions as the sun hit the golden hour. The finishing hole at Windsong Farm is stunning in every way. The tee shot features aiming bunkers in the distance and plays slightly uphill. The hole doglegs to the right and features water on the inside of the hole from tee to green. The left side of the hole is banked up and will kick balls back towards the fairway/green. The large clubhouse frames the back of the hole and is a really nice finish to the round. Tired and windblown, we find a local diner to eat dinner at. It�s nice to just relax and chat. We�ve spent our non-golf time in Minnesota driving through the area and chatting about the things my Dad remembers. 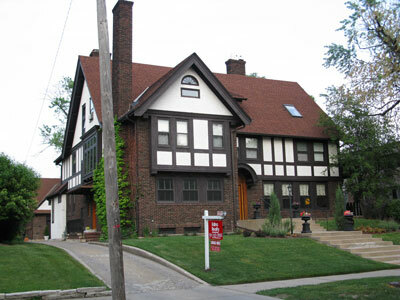 We found the house that my Dad lived in while in Minneapolis and it was for sale. We pulled a flyer and the price seemed quite reasonable for such a large home (about $300K). After studying the flyer further, we discovered that the garage and apartment above was for sale and that the rest of the home had been converted to a multi-plex that had most recently sold for over $1 million; that made more sense. The garage had one of those rotating floors so that you could pull your car in, push a button, and the car would be rotated around so that it was facing out again. It was a way cool feature, but limited you to parking one car in the spacious garage, which back in the day probably wasn�t a problem. Like all golf trips, they come to an end way too soon and our last day in Minnesota was all of the sudden staring us in the face. We start the day at The Minikahda Club which is another Donald Ross design. We were told they would send us off with some members by 9:30. So we rolled into the club around 8:30 figuring we would have plenty of time to warm up and get ready to play. When we checked into the clubhouse we were informed that the members we were playing with were on the 1st tee and told us to go join them right away. We hustle over to the 1st tee and quickly put a peg in the ground. In my rush, I didn�t tuck in my shirt and the starter informed me that I needed to give it a tuck before heading out. I hurry and make myself more presentable and first a tee shot. It hangs out to the right but stays in play; Dad pipes one right down the middle. Not a bad start for getting ready so fast. Minikahda ended up being way better than I expected. It was great! 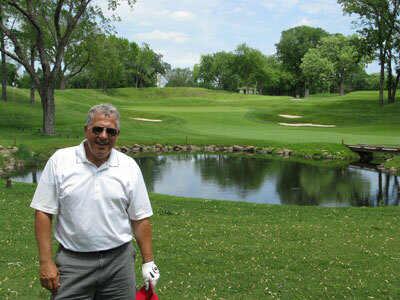 The course isn�t very long but has more character than any course I�ve played in recent memory. When you look at the scorecard you expect the course to be a pushover, but it was far from it. There are so many little nuances that can only be mastered after years and years of play. I was off my game and Minikahda ate my lunch while my Dad was zoned in and played great (shot in the 70s). The two members we played with couldn�t have been better guys. They were a complete joy to play with and then spent time with us in the clubhouse showing several historic items including photos and newspaper articles from 1916 when Minikahda hosted the U.S. Open (Chick Evans won). The risk/reward par five 13th hole was my favorite of the day while the collection of par threes were second to none. Following our round at Minikahda it was time to grab some lunch before heading over to storied Hazeltine National. I had done some research on places to eat before leaving and one place that kept being recommended was The Original Pancake House where the massive apple pancake is served. The apple pancake is a thick, plate sized serving that is oven baked with Granny Smith apples and Sinkiang cinnamon and is then smothered in syrup. It is unreal in both size and taste! My Dad ordered a more traditional breakfast plate and sampled my apple pancake along the way. We left with big smiles and large stomachs. 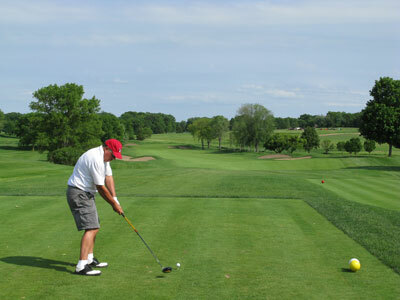 The final round of the trip was at Hazeltine National which hosted the 2002 PGA Championship and was scheduled to host it again in 2009. It was really fun to play at Interlachen three weeks before the Women�s U.S. Open and then Hazeltine a year before the PGA Championship; it isn�t everyday you get to play a course that you�ll get to see on TV with the best players in the world attacking it. 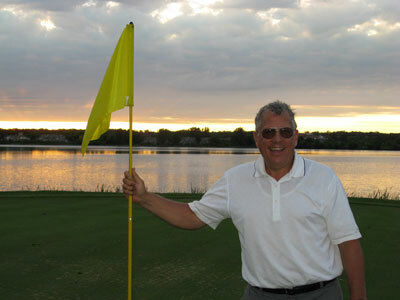 The staff and membership were very friendly and we felt very welcomed at this famous course. Hazeltine�s reputation has increased since it�s relatively rocky beginnings. Tour players blasted Hazeltine in 1970 during the U.S. Open as being way too hard as nearly half the players didn�t break 80 on the first day. 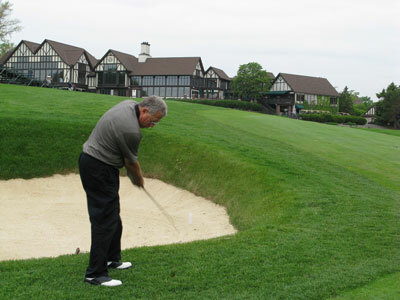 The course hosted the Women�s U.S. Open in 1977 and then the course began to undergo changes. Hazeltine was back on the big scene again in 1991 hosting the U.S. Open and then tragedy struck in the form of lightning, killing one spectator. By 2002, enough changes had occurred to the course and improvements made that it was an excellent host for the PGA Championship. In 2006 it hosted the U.S. Amateur which completed the holy trinity (U.S. Open, PGA Championship, U.S. Amateur) of major championship golf while the icing will be put on the cake in 2016 when it hosts the Ryder Cup. Dad and I decided to film ourselves playing various holes throughout the round. The course was tough due to the length and rough, but we had a great time. The signature hole at Hazeltine, and maybe all of Minnesota, is the par four 16th hole that Johnny Miller said was the hardest par four he�s ever played. The landing area is mostly blind from the tee as reeds block your view. Over 200 yards is required to carry the lake off the tee and find the fairway of this dogleg hole that wraps along the lake to the right. The peninsula green puts plenty of fear in your heart when you swing away and leaves no margin for error. Being one of the last holes we�d play on the trip and probably the most famous, we got two cameras rolling to follow our result. My Dad, who is generally a bit intimidated by forced carries, stepped up and piped a big drive right down the middle! It was a great shot and a ton of fun to have on camera - click here to check out the video. 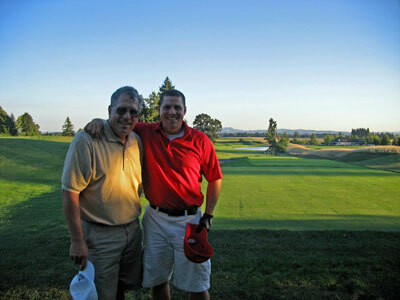 We both went on to par the beastly par four and walked arm in arm down the final holes; partially as a bonding moment and partially to lend some support to my Dad who was feeling the effects of such a rigorous golf trip that he valiantly completed. The trip that we took to Minnesota will forever be engrained as one of the greatest memories I ever had with my Dad. The trip was an enjoyable tribute to the past by visiting an area my Dad lived in 40 years ago while paying tribute to some of America�s finest and historic courses. It is a rare experience to play alone together with your father at major championship venues; of course it is an even more rare experience to have a Dad as special as mine.